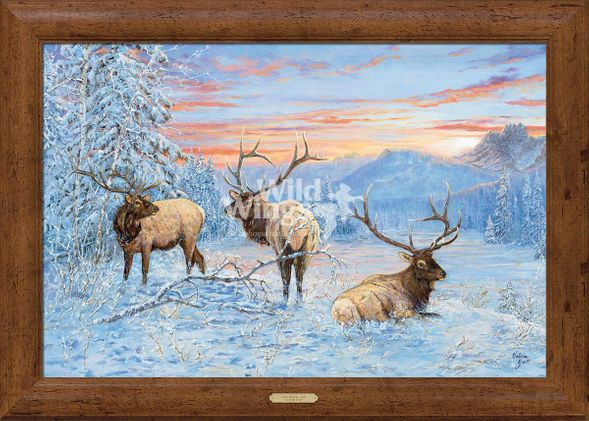 Home | New Releases | Valeria Yost Open Edition Framed Canvas:"Line Shack – Elk"
Valeria Yost Open Edition Framed Canvas:"Line Shack – Elk"
About the Art: “I wanted a painting filled with peace and tranquility; visitors have arrived.” - V.Y. Signed and sequentially numbered open edition canvas art print made from the original acyrlic painting. Image size, 24"H x 36"W. Framed size, 30"H x 42"W with 3" dark walnut finished rustic pine moulding and brass nameplate. Home | Fine Art Prints & Limited Editions | Wild Wings | Wild Wings New Releases | Valeria Yost Open Edition Framed Canvas:"Line Shack – Elk"
Home | Fine Art Prints & Limited Editions | Wild Wings | Valeria Yost | Valeria Yost Open Edition Framed Canvas:"Line Shack – Elk"